DNA of the human body? If our DNA determines certain patterns within the human body such as hair color and eye color, if scientists were able to "turn off" such as the gene for eye color after the pattern was established, what would happen? 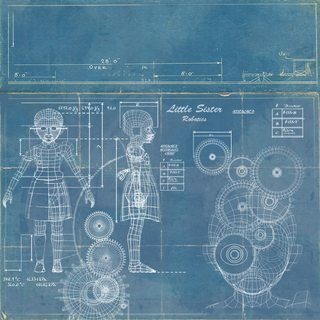 If you use the blueprint above to make yourself a little sister and later change the blueprint, the sister you built will not be affected. That is only part of the story though, the analogy can only go so far. DNA is constantly "read", what this means is that genes are transcribed to RNA which in turn is translated into proteins. To use a horrible simplification, genes are the blueprints for proteins. Therefore, if you change the gene, and the cell then reads from it to create a protein, it will indeed create a different protein than what the original gene would have coded for. The point I am trying to make is that depending on which genes are changed, you can either have no effect or a huge one. Some genes are only read once when the cells are reproducing, others are read constantly as the proteins they code for are used up and then produced anew. So, if the gene you change is one that will be read again during the cell's lifetime, then you will see a change. A classic example of this is cancer. If, on the other hand, it is a gene that will not be read again, then the changes will not have any effect. I'll just extend terdon's answer into more concrete terms. Every time the cells try to produce a pigment, they read that particular gene. But now, they find the "brown version", and produce a brown pigment instead of a blonde one. On the other hand, if you replace the gene affecting the length of a person's fingers, they may not just sprout a couple of extra centimetres over the next few months. Those genes may only be read at a particular time of life, such as during puberty or as a child, so they have to be in place at that moment to have much of an effect. By the way, that idea of replacing all the copies of your DNA with a different version is roughly called "gene therapy", and we're still really in the investigation stage of research (to my knowledge). Can forensic DNA analysis be used to generate a visual approximation of a suspect? Why do our epiphyseal plates close up in our late teens or early twenties?